Wilfred frost: brian, thanks so much for joining us. Brian Moynihan: it’s my pleasure, Wilf. Good to see you again. Frost: I hope you caught Stephanie links’ very kind compliments just before we joined you. Moynihan: I think I caught them, but if they were good, I must have heard them. Frost: exactly. We’re going to start, Brian if we may, on the sort of macro picture. I interviewed you on December 4th at the Goldman Sachs conference. You were very upbeat then about your outlook for the U.S. Economy in 2019. Are you still as upbeat? 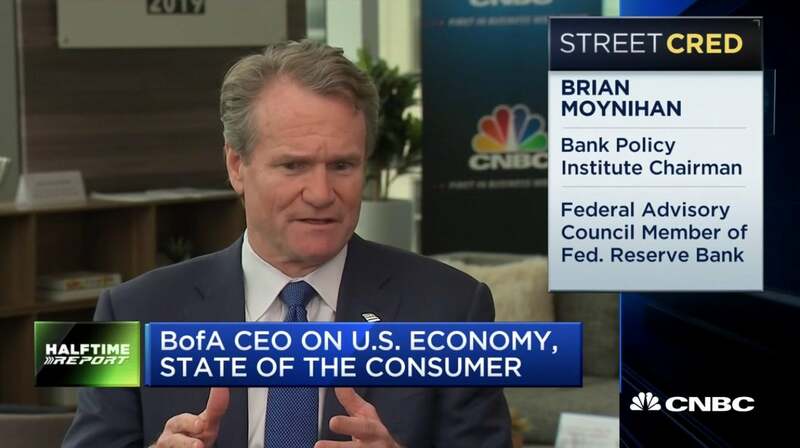 Moynihan: we still have our experts for the u.S. For ’19 at 2.2% that’s probably come down when we were talking there by, I don’t know, 0.3%, 0.4%. And that’s largely due to the slowdown around the world and the trade and all the things we talked about back then. But I was hearing your colleagues talk about – if you look at consumer spending and you think about ’16, ’17, ’18 and now ’19, you saw it grow through the peak at ’18. It’s now consistent with where it was at ’16 and ’17, sort of growing at 5% in our card spending and our use of cash as opposed to 8%. And that’s consistent with the economy slowing down. What we don’t know, and will take a while to find out, is what was the impact of the shutdown and things in the first month of the year in terms of just enthusiasm in December, your colleagues were talking about – as we see that play out. But you’re seeing with mortgages picking back up, you’re seeing the consumer in the game, continuing to spend, it’s the biggest economy in the world, almost up by itself and we consider it to be constructive on growth. Frost: to the point of the consumer, retail sales data come out yesterday for February and significantly disappointed. You’re always very up to pace, up to speed on what consumers are doing. What have you seen for February and in march? Moynihan: and so what’s interesting is they were lower in February but they restated the month prior which we all rung our hands about. And so this data is hard and I ask our economists all the time how come it gets moved around considering that other data doesn’t. But if you look at bank of America's data, which will be $3 trillion of money spent on credit, debit cards, ATM cash out, teller cash out, checks written, p to p transfer in a year, that is going to grow 4.5% to 5% for this quarter. That is all forms of cash, digital growing faster than non digital and that’s consistent more with a 2% type of growth economy as opposed to 3% we had last year. Frost: Larry Kudlow was on CNBC last week and he called for a 50 basis point fed rate cut. Do you think that’s warranted? Moynihan: I think that the economy’s growing, the fed is trying to get themselves more to neutral, that’s what they said. I think the goal of the fed is – that their charter is not to try to push the economy. It’s to make sure the economy, price stability, unemployment, things like that. And I think that’s where we are. We’re kind of to a 2% plus growth economy and we’ve got low unemployment and wages are growing faster than people think and people are spending. I think they are playing it the way they should. Just let the data tell you what to do. And they were clear about that. The markets going back and forth, but they’ve always been clear that when they got in this range, they’re going to pause to take a look at what happens next. And that’s the thing we have to be focused on. What happens next and that’s the type of data you’re talking about. Frost: so the economy from all the data you’re seeing is not in any kind of emergency scenario that warrants further immediate action? Moynihan: no, the big debate here is we’re slowing down. And we’re slowing down a little faster than what people predicted before the trade wars and stuff and some of the stuff that happened at the end of last year. The reality is that is coming back through the system and I think if things fall in place with agreements with china and other things, you would see that would sort of fade to black and go away from people’s memories. But right now, that’s what caused people and the activity to slow down. The rest of the world is more interesting. It’s slowed down to 3.3% in our projection for ’19. We’re probably as high as 3.8% in the third, early fourth quarter last year, that in large part due to it being more affected by these elements than the united states. But the united states economy is strong, it’s growing, more people working now than ever, the unemployment claims are low. Wages are growing fast. Our wages have grown 6% per annum for the people in our company that are below medium wage in our company and down. It’s a good place right now. And I don’t think we need to juice it. I think we got to let the economy work. Frost: when you see how your share price and your pay group share price has reacted, do you think banks investors overreact about the shape of the yield curve and what it means to banks? Moynihan: the question is if you’re an investor that believes that because it inverts and becomes flat, that a recession is coming. You can understand that because banks are going to reflect to some degree the recession through their p&l because we transmit the economy. We don’t drive the economy, we transmit the economy between consumers and companies and employers and people and investors in the market. So that’s what we’re going to see. I don’t ascribe to that and I don’t think most people do, but if you believe that’s the output you would say, “yeah they may have to move,” but that’s not what is in the data right now. That’s not what we see going on right now. And time will tell. We are at 2.2% you’d have to look back and say that growth rate, this is as high as it’s been in almost every year since the initial recovery after the crisis. That’s okay. Do we want it to be faster? Everybody does. That’s easy. Life would be easy if it were faster. But the reality is it’s growing and growing strong. That’s the base. Is it growing and keep going down or is it flattening out? We see it flattening out and we see the consumer spending kind of consistent with that. Frost: let’s talk about the banking industry more broadly. The BB&T sun trust merger, the combined entities going to operate very much in your geographic footprint. Do you see that as leading to more competition for you or less competition for you in that region? Moynihan: Kelly and bill run great two banks we compete with every day so I don’t think it changes. You know, I think we compete in all our markets against a variety of competitors, the big ones, the small ones, the medium sized one, we’re here at the CBA in an audience of 1,000 people that you and I will talk to in a while. It’s every participant. And in this industry, you always have that variability to it, like other industries do. Local drugstores and the national chains, local hardware stores and the national chains, local diners and the national chains. That’s what’s going to happen. So it doesn’t change our view of our capabilities, it might change other people’s view of what’s going to happen in the industry. And as you know back when I think we were talking in Davos, I said I could see consolidation taking hold largely because the economies of scale for those people who are bigger to get bigger is really important. Doesn’t mean other people won’t be able to play and be very successful. Frost: I want to talk about capital markets. Sergio Ermotti of UBS described q1 as one of the worst environments he has ever witnessed. Do you think he’s talking about Europe there as opposed to the u.S. For this past quarter? Moynihan: I’ll let Sergio speak for himself, but all our peers and we are with the same range of several coming down year over year you got to remember, last year, first quarter after tax reform passed at the end of ’17 without much belief it could, it passed. That was a pretty strong equities business in the first quarter of ’18 that has come off. We’re down 20-odd percent from that. Overall we’re down 15% or so, probably. But if you think about that, what we’ll do this quarter is consistent with the last ten quarters average. So it ebbs and flows. The question on my mind is this more like a ’16 where the first quarter was not so good and the second quarter was better because the government shutdown and the activity pushed to the second quarter. And then it wasn’t the government shutdown, it was other things, but it pushed the second quarter. Or is it a case where the markets were more muted. As you saw, march picked back up, you said it’s probably more of a case where as we always say last year’s first quarter is this year’s second quarter. I think you will see better going ahead because you’ve seen during the month of march it was a little ugly in December. January with the shutdown, things couldn’t get done, new issues. The s.E.C. Wasn’t open. Now it is starting to pick back up. We feel pretty good right now but it’s going to be that that range. Frost: I want to ask about the Lyft IPO. Down 7% from the IPO price, down 24% from its peak on the first day of trade. Does that damage the prospects of the IPO pipeline given that it has had such a soft first couple of days trading? Moynihan: you know, I think these are driven by the institutional markets and they have their views of valuation and the companies and they’ll buy them or not. And then retail comes in. I would, you know, this gets into trying to evaluate a company I haven’t spent any time trying to understand their financials. So I would leave that to others in our team to do it, but I think it’s always better to have stocks relatively sound after an offering because that means the investors will have more enthusiasm. That’s a great debate of how you run an IPO that you guys have been talking about. And at the end of the day this is all the first three days of trading, whatever. The question for these companies, as our company, is what are you going to do long-term? And that will play out. Frost: final question, Brian. You’re back here next week for a hearing in front of the house financial services committee and just last week, your peer, Tim Sloan, retired in part due to serious political pressure. Is there a part of you that looks at this and thinks, for us, for banks, the political pressure was ten years ago, we’ve been through this and this is unwarranted and unfair to be facing it again. Moynihan: it’s never unwarranted or unfair. We have a special purpose and charter and that’s to serve communities and to share our success with those communities. And so when that’s what you do every day, to help the core economy activity take place, it’s obviously the policymakers that are going to be interested in a given moment what’s going on. And so the scrutiny across the last ten years and before is always, you know, has been consumer questions, how to get more mortgage loans out there today, we announced a $5 billion program to get more down payment qualification, didn’t change credit, didn’t change FICO score or qualifications, prime customers, but we’re helping them get down payment relief faster so they can get into the houses faster. You know, that’s one thing. Other people were worried about the capital market side and that stuff. So it’s fair to be asking these questions. At the end of the day, if you look from a decade, our industry is extremely strong, and you can see that in a stress test, things that didn’t exist, the resolution plans, the stress tests, the capital levels, we have probably three times as much capital, we’re 25% to 30% smaller than we were performer – Merrill Lynch today. Frost: that’s the regulators’ ballpark, though. What about the politicians? Did Tim Sloan face undue personal pressure? Moynihan: look, Tim is a colleague and I enjoyed working with him. And we did some fun things together like Zelle and these things over the years. Look, I had some fun with the political pressure. Again, we face political pressure all of the time, that is part of the job. But it is really part of what we do. And at the end of the day, because we are so embedded in the fabric of American economy as banks, this is part of the job description, so we will get a chance to tell our story. Frost: ok, well we will be covering that next week and I look forward to talking with you on stage in front of the CBA any minute now. Brian, thank you so much for joining us.